PDF of Catering Booklet with menus and pricing. McGirk’s offers catering and beverage services in our own event space, the Blarney Room, accommodating 30-100 guests with a private bar and plenty of customization options available. We are also available for off-site catering and beverage services at private homes and other event venues. McGirk’s is an exclusive beverage vendors for The Orchard at Chenango Commons, a premiere outdoor event venue in Chenango Bridge. 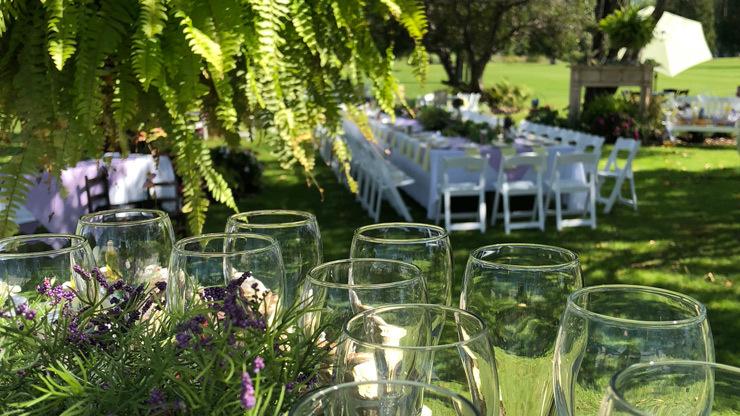 Because we’re neighbors, we are a great spot for rehearsal dinners and morning after brunches for events in the Orchard. First, discuss your ideal event date as soon as possible. Contact Megan Ward by phone at 607-648-9988, or by email at megan@mcgirks.com. Want McGirk’s to cater or provide beverage service in The Orchard at Chenango Commons, at your home or another private location? Off-site catering and beverage services have a $3/guest per menu fee that covers staff/services before, during and after your event. With that in mind, browse through our menus to see what will work best for your event. Keep in mind these are suggested menus, we can always customize food and beverage choices! Want your event in the Blarney Room? We can help with the decor, picking out linens, and creating centerpieces. We have an extensive collection of vintage place settings for a more eclectic touch, ask about adding those to your event as well! All prices are: subject to change, an 8% NYS sales tax and 20% gratuity. I am organizing a party for my local Kennel club. It will be approx 35 people. I would be choosing from the deluxe menu and adding the soda charge at $3.00 per person. What would be the total including tax, and gratuity? Is there an additional $200.00 charge? I am planning for Tuesday November 10. Hello Stephanie, thanks for thinking of McGirk’s for your event! Our staff will be in touch with you soon via e-mail regarding your request.